Marksmen killed an endangered gorilla at a US zoo on Saturday after a four-year-old boy managed to get into the animal's enclosure, sparking fury around the world. 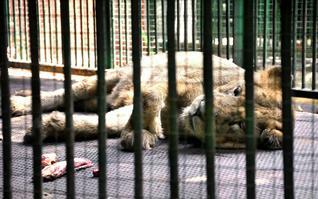 It also raised larger questions about the morality of keeping wild animals in captivity. 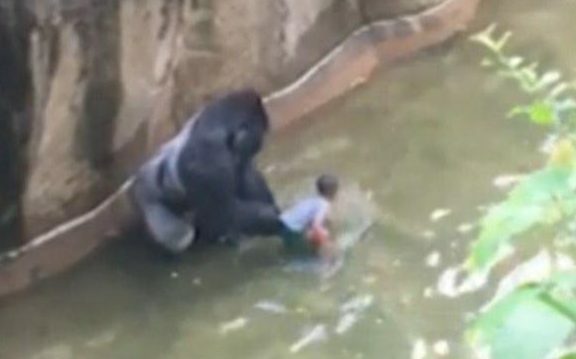 Harambe, a 17-year-old, 400-pound male gorilla, was shown on video with the child between his legs before he was shot at Cincinnati Zoo in the US. Hundreds of people took to Facebook and Twitter calling the shooting “murder” and widely blaming the incident on the boy’s parents for losing sight of their child. 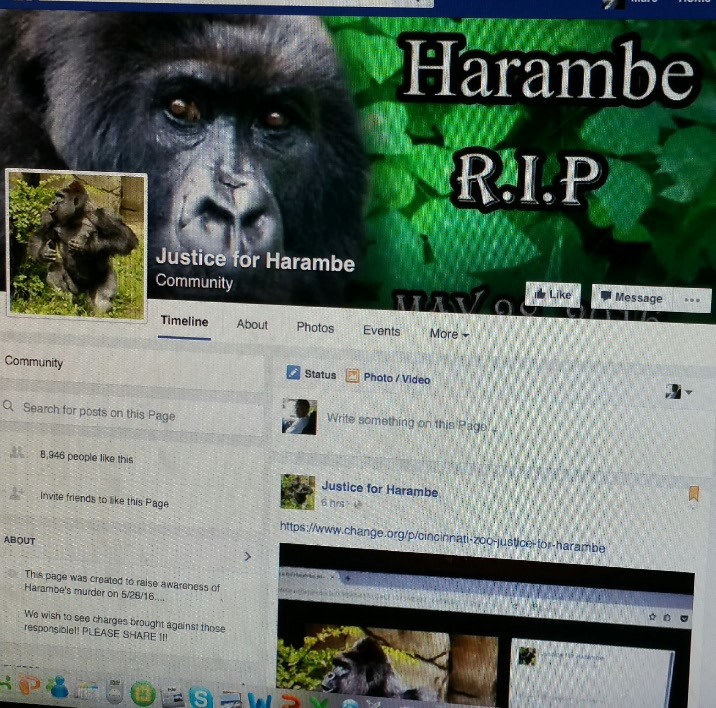 A Facebook group called Justice for Harambe gathered more than 14,000 “likes”. In The-Latest.Com's Facebook citizen journalism group Jenny Vaccianna wrote: "Beautiful creature which appeared to me to trying to help." Bertha Joseph responded: "Indeed. I thought he was quite caring & protective. Then again I suppose despite the rights & wrongs the child's life was of paramount importance. Very sad situation." Summing up the overall view, Jeanette Joseph said: "Senseless killing seems to be the world's ethos." Harambe was killed because security guards said they feared for the child's safety. Three gorillas were in the enclosure at the time, but the two females were successfully called away from the boy by park officials. However Harambe remained near the boy, at one time “violently dragging and throwing the child,” reported the Cincinnati Fire Department. Zoo officials say they chose to kill Harambe instead of tranquilising him [or another option favoured by some experts] because “in an agitated situation” tranquilisers may take some time to go into effect. Maynard added that while the gorilla did not attack the child, it was a dangerous situation and zoo officials feared for the child’s life. But reports of the alleged violence have differed, with some zoo onlookers saying Harambe seemed protective of the young boy, only alarmed by officials and visitors’ frenzied responses. The young boy was taken to a nearby hospital with serious but non-life threatening injuries. The incident sparked social media outrage. American writer and artist Charles Alexander captured the mood on Facebook where he wrote: "Harambe died today, one day after his 17th birthday. Son of Moja, he was born and raised at the Gladys Porter Zoo here in South Texas - a magnificent western lowland gorilla." He added: "Everyone loved him here. Last year, the big guy was sent to Cincinnati Zoo to meet some girls. This afternoon, Harambe was shot dead when a small child crossed a railing, got through a fence, past thick Pyrecantha bushes and a 12" thick concrete wall - and fell into the gorilla moat." Alexander demanded to know: "Where were the parents of the child? Looking at their cell phones? I see kids running wild all the time at the Gladys Porter Zoo, at every zoo I visit. Chasing peacocks, yelling at the animals, feeding animals, throwing stuff into exhibits, often totally unsupervised and undisciplined. Adults do the same crap. Ignorant and self-entitled to do what they please, here in this very special place that many endangered species call home, they couldn't care less about the consequences of their behavior. Now Harambe is dead. 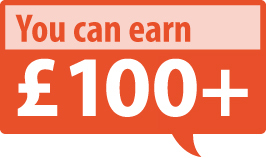 Great work people! Animals lose again." Although this is the first time the Cincinnati zoo has killed an animal in this manner, a similar incident happened just last week at the Santiago Metropolitan Zoo in Chile. 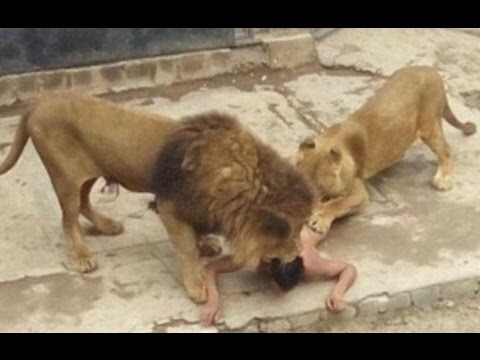 Two lions – one male and one female – were shot by park officials when a man jumped into the big cats’ enclosure at the zoo. 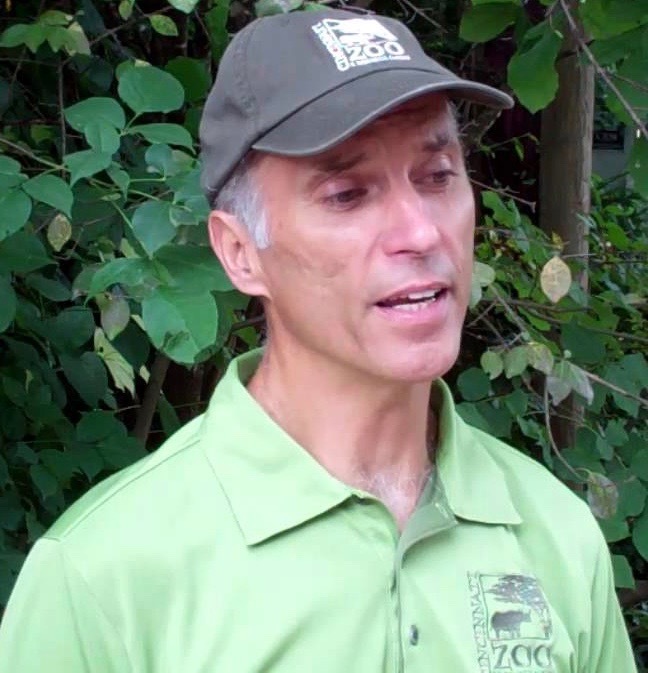 According to a BBC report, zoos officials prepare for similar incidents at least twice a year. And while they never wish to use their training in a real-life scenario, human life is always the “first priority”. But animal enclosures are made increasingly wide and protective: To reach the gorilla, the young boy had to first climb under a steel railing, and through some bushes and wires before falling 10 to 12 feet into a moat surrounding the gorilla’s home. Others say it is not a matter of stronger enclosures or better safety practices: They charge that zoos are unnatural and wild animals should not be kept captive. 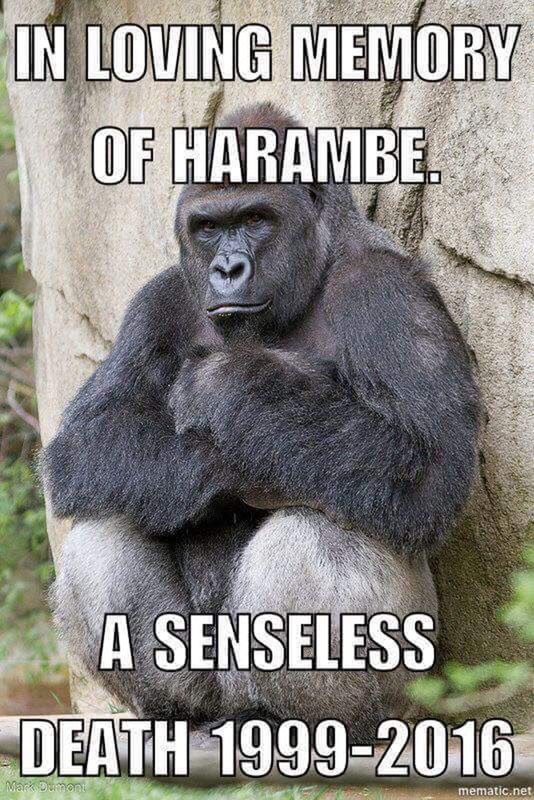 On Twitter supporters are using the handle #JusticeforHarambe. Many users are calling for the boy’s parents to be held responsible for Harambe’s death. Tracy McGill (Frank) (@tfrnk tweeted: "I hope there'll be some kind of charges brought against parents whose negligence caused the death of a beautiful gorilla. While Tanya Osterman (@TanyaOsterman said: "The parents of the child who got into the gorilla enclose should be sued for Harambe's loss!"